Elephant is one of the flag species of nature conservation and a heraldic animal of the CITES convention. It is, however, also an illustration of how the animal conservation can be difficult as it is often more about money and politics. Elephants are social animals living in family herds led by the oldest, experienced female. A herd is made up of the female’s offspring, adult daughters and their young. Teenage males must leave them – at first, they gather in youth groups, then they live solitarily. Leading females and their experience are key for survival of elephant herds. Thanks to the excellent memory, they orientate very well in the field, they remember the landscape, places with food and water sources, and migrate for long distances via old migratory trails. A leading female knows where a danger is and how to avoid it. Family bonds are very strong and important to elephants, related herds build friendly clans which meet and migrate together. Such a clan made up of more family herds can count even a few hundred animals. Elephants are very intelligent, they express joy and sadness, communicate through a complex of sound signals. They also use deep infrasound (inaudible for people) which is carried over long distances. “Long-distance” elephant talks can take place over up to 15 kilometres and they enable communication between herds or between males in musth and females in oestrus. Virtually all around the world, elephants are considered a symbol of good luck. Most people love and admire elephants. Plush elephant toys, elephant statuettes, elephant pictures… Representation of elephants can be found almost everywhere. So why are we killing them? Unfortunately, they have something special… Ivory tusks. In fact, tusks are teeth-incisors which grow during an elephant’s whole life. No other animal than Indian, African and forest elephant (and in the past also a mammoth) has teeth of such size and volume. The largest tusks can usually be found in old bulls – in African elephant, they can grow up to 3 m length. The largest recorded tusk was 3.45 m long and the heaviest one weighed 117 kg. Indian elephants have smaller tusks and females of this species do not have them at all. Ivory is a very good material for carving – it is hard and durable but good for processing. It has warm beige colour that gets darker and yellow when exposed to UV radiation. Characteristics of ivory from the three elephant species differ – predominantly, soft ivory from savannah elephants and hard ivory from forest elephants are recognized. The latter is the most valued among Asian carvers and traders. Ivory from Indian elephants is very rare. It is not possible to cut tusks off of elephants and let them live, unlike in the case of rhino horns. An elephant must be always killed to obtain its tusks. Every object made of ivory comes from a dead elephant. Main use of ivory is in manufacturing of decorative objects and ornaments, e.g. things that one can easily live without. Luxurious carvings, jewellery, food sticks, wedding bracelets, buttons, intarsias… In Europe, ivory used to be used for billiard balls, combs, cutlery handles, church monstrance, etc., in America also for piano keys. Even today, there is a high demand for Christian icons made of ivory (especially in the Philippines). Extensive is the production of “hanko” – stamps that substitute signatures in Japan. In the past, hanko stamps used to be made of wood and only the tip with carved symbol was made of ivory. However, as the prosperity of Japan increased, so did the interest in “better” whole-ivory stamps. Unfortunately, one tusk can be used just for a few hanko stamps as they are made from the most valuable and hardest inner part of the tusk close to its centre. It is necessary to realize that demand creates offer so everybody buying anything made of ivory participates in elephant killing. With no exceptions! Even a tourist buying a small souvenir or jewellery made of ivory is an indirect killer. The situation was quite similar in many African countries, but the sample case is Kenya where the situation culminated in a period of time called “War on Poaching”. The whole story of the fight for elephants is in detail and very interesting way described in the Richard Leakey’s book Wildlife Wars (BB art, 2003, St. Martin´s Press New York, 2001). “I know that 75% of you are crooks and poachers so all of you are fired” – with this sentence Leakey began his entrance in the function. He transformed the corrupted ministry into Kenya Wildlife Service, he was searching for support and grants, provided rangers with equipment and regular salary, but at the same time he demanded discipline. Training of the units took place in an army way. According to the classic army tactics, it was necessary to find out how the trade works, who is behind it, who funds it, what the routes are and where possible weak places are. At that time, poachers already attacked even tourists which they killed and stole from them (killing of tourists took place in Tsavo and in Meru). Fight against poachers thus quickly escalated because Kenya was afraid of losing gains from tourism. In summer 1989 during their raids, KWS units killed around 25 poachers. Poachers usually gathered in small groups of around 3 people. The worst situation was in Tsavo and Meru which neighbour with the area of tribes with ancestor clans. Clans and their family bonds protect poachers from their own tribe, they provide them with food and shelter and never expel them. Some poachers, however, lacked these bonds and, armed with guns, robbed even local people – KWS was thus trying to gain villagers to cooperate. In some specific cases, it even offered locals exemption from their punishment in exchange for information and cooperation. During a quite short time, Leakey and his units managed to get poaching in Kenya relatively under control. Number of poached elephants decreased from 3,000 to 40 individuals, profits from admission fees to national parks tripled. It was a heroic achievement, but elimination of poachers is always just a temporary solution. More important was to stop global ivory trade which would take away the market from poachers. Trade in ivory has a long history – it was used as a material already back in the Stone Age (paleolith), first records of trading in ivory come from the 14th century BC. For a long time, it was a basis of African trade – ivory was traded already by Romans. By the time of the demise of the Roman Empire, elephants had disappeared from the northern part of Africa. Since the 11th century, Arabian traders searching for ivory and slaves started penetrating into the interior of Africa. Tusks and slaves were transported to the Arabian Peninsula, Persian Gulf and Far East. Although the trade in slaves ended after colonization of Africa, trade in ivory continued. Most tusks were being sent from Mombasa to Great Britain, and Europe was a major market. At the end of the 19th century, around 1,000 tonnes of ivory were sent to Europe. Massacres of elephants were so huge that in 1890 British in East Africa announced the first law on protection of elephants – it was prohibited to shoot elephant females and young animals. In that time, officers believed they were managing ivory trade in a sustainable way – that they kill only a number of elephants necessary to supply the market and fill treasuries but that they do not put elephants at risk. It is an irony that profits from ivory trade financed the establishment of the first Ministry of Live Nature, and even a bigger paradox is that despite all the progress and available information, this way of thinking in terms of “sustainable” use of elephants has not changed to these days. Both world wars caused a temporary decrease in demand for this luxurious commodity but as the prosperity was increasing, the demand was being renewed as well. At that time, major consumers of ivory were western European countries and USA. Japan, which was exempted from post-war economic restrictions, started to gradually purchase ivory for production of hanko. In 1980s, Japan was the main market (40% of the global ivory trade), another 40% went to Europe and USA. China was just a marginal market at that time. Up to 75,000 elephants were killed every year and the turn-over of the ivory market was around 1 billion USD. Just to make a better picture – annually, Germany imported around 19 tonnes, Great Britain 21 tonnes, France 31 tonnes, Spain 28 tonnes, Italy 18 tonnes, etc. Elephant numbers were quickly decreasing – at the beginning of the 20th century, there were around 3-5 million elephants in Africa, in 1979 it was only 1.3 million. Although many people (ivory traders in particular) claimed that the reason of the decline is habitat loss, it was more and more obvious that the main cause was the international ivory trade which was getting gigantic proportions. In 1985, a system of quotas and registrations was implemented but even this was circumvented – there was nothing easier than to report quotas even though the country did not have any elephants (e.g. Somalia, where 6,000 elephants lived at most, reported an annual quota of 17,000 tusks, Burundi had registered 89.5 tonnes…). Illegal ivory from poachers could just be imported into a country with a quota where it got legalized. Until 1988, nobody was attempting for a total ban on ivory trade. It was a very controversial topic that excited (and does so even today) strong emotions. Even some conservationists were against the ban, arguing that the ban would increase prices and that African states should manage their wealth by themselves. In 1989, Kenya submitted a proposal on reclassification of elephants in CITES Appendix I which would de facto mean a global ban on ivory trade. And the situation became dramatic! Besides humans, elephants are the only animals able to actively modify a landscape. When searching for food and water, they break branches, tear out trees, dig holes. Many elephants on a small area can destroy vegetation. For years, conservationists have litigated about how to deal with it – how many elephants can be sustained by fenced national parks and reserves, and what if there are more of them? Elephants, or landscape? More or less, two approaches to the management exist, and they define the two camps of African countries in the battle for ivory trade. CITES did not endure the pressure and in 1997, some elephant populations were rearranged in a weaker category of protection – CITES II (Botswana, Namibia, Zimbabwe, and in 2000 also South Africa). Ban on ivory trade thus ended, it was in place only for 10 years. In 1970-1988, elephant populations in Africa were reduced by more than one half – over 600,000 elephants were poached. Poaching took place almost everywhere and violence escalated. Elephants were hunted by corrupted park rangers or army members. Even senior government officials were involved in the illegal trade (for example the family of Kenyan president Jomo Kenyatta). It was even proven that South African and Angolan armed forces were guarding their combat operations from money from illegally obtained ivory and rhino horns. Ivory was considered a part of war gain. However, the situation was changing – number of African inhabitants was sharply increasing, which meant less space for elephants and other animals. In 1970s, also a boom of tourism and travelling came. Huge crowds of people wanted to visit exotic places and many of them felt the need to bring home an ivory souvenir. Traditional sources of ivory were not enough to meet the demand, so prices rose rapidly, and the insolence of poachers and traffickers grew. However, there were people who supported this ban. A representative of Tanzania said: “Every valuable act consists of a victim element. Loss of profits itself is not a sufficient argument against the ban. We are talking about a survival of a species which is important for the mankind and for Africa. Every generation will be judged according to its moral courage to protect species that are under threat of extinction.” While Africa was having disputes, Western countries were quite clear. American president George Bush declared a ban on ivory imports to USA, and a few weeks later, the same ban was applied by Margaret Thatcher in Great Britain. Department stores and jewellery stores in Britain and USA stopped selling ivory, Sotheby’s auction hall announced it would not accept it in auctions. Kenya supports the approach without interventions in natural development. It was documented in Tsavo NP where overpopulation of elephants caused destruction of tree vegetation zone. During the next dry season, elephants did not have enough food and part of elephant herds decreased and died naturally. Numbers of elephants dropped, the ecosystem was given a chance to renew – at first by grasses, later also by shrubs and trees. South Africa promotes the idea that protected areas are an artificial ecosystem which must be regulated. A regulation called “Elephant Reduction Programme” meant killing whole elephant herds from helicopters. Elephants were drugged by a drug shot from airplanes (choline stops muscles from working), shooters then killed the elephants by shooting them in heads. Then, butcher groups came, processed the meat and transported it to slaughterhouses where it was dried and salted as dog food. Whole herds had to be killed because due to the elephant memory and intelligence, survived animals would pose an extreme threat. Just a few calves independent on milk were sent to circuses or zoos (small calves were killed just like adults). This regulatory killing was underway every year, however, elephants learned what the sound of helicopters meant (most probably thanks to the long-distance communication) and when they heard it, they started panicking. “Elephant Reduction Programme” had to be ended in 1995 due to strong protests of general public but was renewed by South Africa in 2008. The outcome is quite the same – elephant population reduction. However, the question is what is better. To let nature be, or to systematically try to regulate it, often by drastic methods? How can we even decide when we still do not understand all the ecosystem processes? War against poachers and the battle for ivory ended in 1989 with success. Pessimistic prognoses of some conservationists that the ban would raise the ivory prices were not confirmed. On the contrary, the prices dropped. However, those who did not like the ban did not reconcile with it. Some countries started to argue that their stocks of seized ivory were increasing which was both a security risk (it could be stolen) and an opportunity to sell it. Unlike Kenya, they were not going to burn the ivory. Due to his strict approach, Leakey made many enemies. In 1993, he had a strange airplane accident during which he lost his legs; to these days, it is speculated about a sabotage. A year later, he was appealed from the Kenya Wildlife Service and the office was transferred under police. And the situation started to worsen again. Since 2005, poaching has been dramatically increasing, number of seizures and the black market ivory prices have increased as well. However, CITES, WWF and TRAFFIC explained it as a possible coincidence. In 2009, CITES approved the 2nd experimental sale – to China and Japan – even though more that 121 tonnes of ivory had been “lost” from state stocks in the past 12 years, which represents around 11 thousand elephants. This 2nd experimental sale came from stocks in Botswana, Namibia, South Africa and Zimbabwe and the volume of 102 tonnes was sold for 15.5 million USD. The deal was that buyer countries would introduce cheap ivory to their markets all at once (they bought it for 160 USD/kg). Authors of this intention assumed that this would saturate the market, decrease prices, and push traffickers and poachers out of the market. Good intentions but bad outcome. The example of ivory shows that experiments are not a good idea if it is not fully understood how a certain system works. Japan and China did not abide the deal and sold the ivory gradually and for a lot of money, i.e. 1,600 USD/kg. This completely opened markets where both legal and illegal ivory was sold which made it impossible to distinguish one from another. A huge escalation of poaching followed, e.g. in Kenya to the level before 1988. International trafficker networks began to operate, and seizures of gigantic shipments of tonnes of illegal ivory destined to Asia started to appear. Poaching took place also in national parks. Nobody admitted publicly that the experimental sales were a mistake. Nevertheless, nobody can deny what followed. The dispute over elephants is still a very sensitive political topic as it involves big money. The issue is sometimes presented as a fight of “Africa versus the West” but African countries definitely are not united in this matter. Some want to release the ivory trade entirely in order to make money, claiming they have their elephant populations alright and that, on the contrary, elephants are overpopulated and destroy the crops. Other countries want to keep the trade ban and get the poaching under control (23 states of African Elephant Coalition). At every CITES conference, there are passionate disputes over elephants, with strong political lobby behind. Discussion is being complicated also by a number of disciplines connected with the issue – biology, ecology, census methodology, international trade dynamics, armed conflicts solutions, criminology, sociology, economy. In this complicated situation, disinformation and lies often occur. The situation nowadays is even much worse than in 1980s and elephant and rhino poaching has reached the highest level in history. Since 1997, the ivory trade has tripled – in 2011 poachers killed 17,000 elephants, while today it is 30-40,000 a year. From several million individuals at the beginning of the 20th century, only 400,000 elephants have remained due to supplying the ivory industry (detailed counting was conducted in 2016). Every 15 minutes, one elephant dies! At this pace, elephants might not exist anymore in 20 years. The problem is that there is both legal and illegal ivory on the market and to distinguish between them is difficult. Poaching is not the only cause of troubles – the main reason of the problem is the existence of legal, official ivory trade. As long as ivory is considered a valuable commodity, there will be black market as well. There used to be tribes focused on hunting elephants in Africa. The most known were Waliangulu people in Tsavo¬ – famous hunters with bows who hunted elephants with a two-meter-long bow and poisoned arrows. Production of poison was a know-how of the Giriama tribe living close to Mombasa – they made it by cooking leaves and bark of the Acokanthera tree mixed with secret ingredients. There was no antidote against the poison (an elephant was dying for hours, a human died within minutes after being shot). However, modern poaching is different. There are two types of poachers. One of them are local people who get only little money for a killed elephant, and as the price of a bullet is high, they often poach with help of snares or poisoned baits. The second type are organized gangs with modern equipment (i.e. automated guns, rifles, satellite phones, off-road cars, night vision goggles, helicopters, chainsaws) organized by international traffickers. These groups usually have a military training, and when meeting with rangers, they do not hesitate to use guns. They invade national parks and reserves where shootings ending with death (on both sides) are frequent. They even use grenade launchers and poisoned baits such as melons filled with poison, or they often poison water in water holes. In 2013, poachers poisoned water holes in Hwange National Park in Zimbabwe with cyanide. Around 300 elephants and many other animals which came to drink died (captured poachers were sentenced to 16 years in prison). Sometimes, bombs are put in carcasses of elephants with cut off tusks which explode and kill rangers inspecting the bodies. In some parts of Africa, money from ivory is used to finance dictator regimes and rebel units which means that the ivory trade is related also to regional safety and puts local inhabitants at risk. Ivory replaces former “blood” diamonds and represents a good exchange commodity for rebels who exchange it with corrupted armed units for weapons. It is an advantageous article even for terrorist groups as it does not require long-term reign over a region as oil or precious stones. At least 12 million USD go to these groups from the ivory trade every year. It is estimated that Al Shabaab obtains up to 40% of its profits from ivory. Only few people realize this link, but the ivory trade is not “only” about elephants. It is also about terrorism and about the fact that by tolerating ivory trade, we enable financing of terrorist groups… European Union thus involved “wildlife crime” (i.e. trade in wild animals and their body parts) in EU Action Plan to strengthen the fight against the financing of terrorism. The raw material is usually exported from Africa hidden in containers (the most used are ports in Mombasa and Dar-es-Salaam) and travels by cargo ships to Asia. 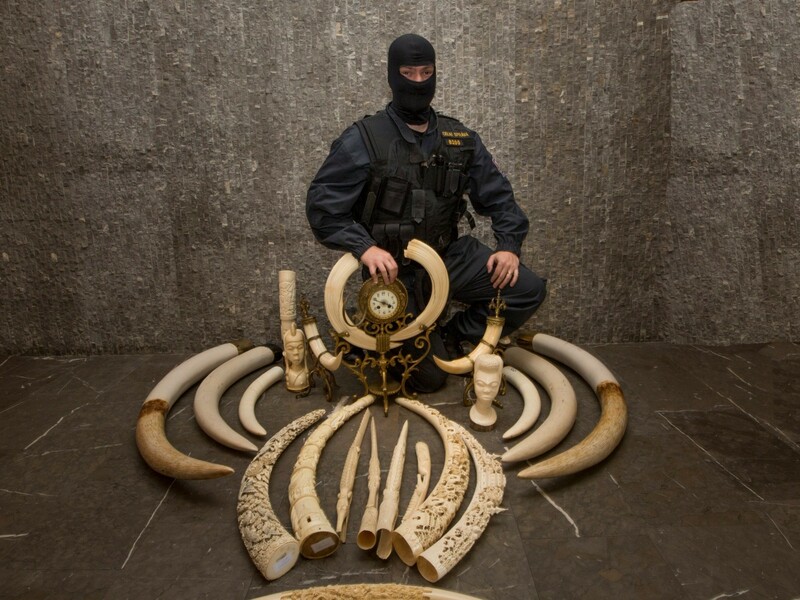 Huge seizures (3-5 tonnes of ivory) are frequent in harbours such as Hong Kong, Singapore or Bangkok. Ivory is often hidden in containers together with timber, rice, fish, etc. From the total volume of seized ivory shipments, 78% come from forest elephants (Gabon, Congo) and 22% from savannah elephants from East Africa. Key evidence can be for example bags the ivory is hidden in, font or inscriptions on tusks, marks of tools on cuts, or a container type. Different shipments with same bags or inscriptions might indicate the same trafficker or transhipment. The group of countries most involved in the ivory trade are called “Gang of eight”. It is three source countries in East Africa where the ivory often comes from – Kenya, Tanzania and Uganda. Further, three transit countries in Southeast Asia – Vietnam, Malaysia and the Philippines, and two main consumer countries – China and Thailand. There are differences among these countries, e.g. Kenya develops great efforts to fight against the illegal ivory trade and is a leading country of the groups, trying to enforce a global ban on ivory trade. China has declared a ban on ivory trade on its national market valid from 1 January 2018, and closed factories for production of carvings. Detecting and investigation must take place on each level in a different way. Most efforts and attention are, unfortunately, focused on suppressing poaching. However, it is not a long-term solution – a poacher on the lowest level can be easily replaced with another one. The key is the organizer and the one demanding and paying – these people initiate the whole business. However, these people are only rarely detected and arrested. People speak about seizures, how much ivory was found, how many poachers were caught etc. It looks good and state authorities like to present achievements in media. Nevertheless, we must ask – were the offenders really accused and convicted? Were the punishments appropriate? Did the investigation continue further and was the one behind it who paid for it detected? Were the traffickers arrested? Was the whole illegal gang and chain revealed? Unfortunately, such finished cases are really rare. Just a minor percentage of offenders (even poachers) are accused and sentenced. So, what is essential to know to effectively combat illegal ivory trade? Where are the main poaching hot-spots? Where does the ivory come from? A typical poaching hot-spot is a place with a sufficient number of elephants with the possibility of taking ivory from there and getting it out of the country. There must be a supporting network of people, often including corrupted officials and rangers, and poachers must know the local environment. To detect hot-spots and the origin of ivory, we can use the help of science – genetics. Using a DNA analysis, it is possible to say where the seized ivory comes from. For example, during a seizure of 6.5 tonnes of ivory in Singapore, a genetic analysis revealed that the ivory came from elephants poached in Zambia. Who are the major players? Who is involved? How vast is the network? Beside the classic investigation, genetics can help here as well. Using genetic analyses, seemingly unrelated cases can be interconnected, and investigators can say whether there is a same gang behind them. There are only few big ivory dealers and main poaching and export groups are often related. How and through where does the trade take place? How quickly? Transport of a contraband is a complex and well-organized network. Trucks have special spaces for hiding the ivory, transhipments are ingeniously masked, and big shipments are sent to Asia via sea container transportation. But one cargo ship has 180,000 containers (around 600 million are transported every year). How to know in which one the smuggled ivory is hidden? Experience, strict controls, investigations, detection dogs etc. are of help. Even Czechs are involved in detecting ivory trade, see the Czech NGO Save Elephants - www.save-elephants.org/. There are also successfully solved cases, although they could be more numerous. In 2015, an ivory boss Faisal Mohamed Ali was arrested in Kenya. During the investigation, evidence of ivory worth 450,00 USD was found, and in 2016 Faisal was sentenced to 20 years in prison and a high fine. A Chinese woman Yang Feng Glan, called Ivory Queen, used to work as a translator of a Chinese company building roads in Tanzania. For more than 20 years in Tanzania, she had led one of the biggest elephant businesses – she illegally exported around 10,000 tonnes of ivory. She had a network of local co-workers thanks to whom she organized the trade. She had a secret room under the floor in her house where she stored ivory, and she also had a full container buried in the garden. She was arrested in 2015 together with her whole network, and now there are 51 lawsuits underway. Ivory Shitan (The Devil), by his own name Boniface Methew Malyango, is a trafficker and poacher from Tanzania. He was given the nickname based on his exceptional cruelty and murdering of witnesses and competitors. He was arrested in October 2015 and in February 2017 he, together with his two brothers, was sentenced to 12 years in prison. There is a Netflix documentary called The Ivory Game about the ivory trade investigation and the case of Ivory Shitan, in particular. It was co-produced by Leonardo DiCaprio and can be watched here: theivorygame.com/. In Europe, there are no seizures of shipments of many tonnes of ivory in ship containers. Does it mean there is no ivory here? No, the truth is that ivory goes to Europe in another way and scattered which is why revealing it is more difficult. Passengers on regular flights are used, ivory is smuggled cut in smaller pieces in suitcases. Control authorities often find ivory in luggage, children toys, drums, furniture, smaller pieces in creams, cosmetics, coffee… Sometimes, ivory is coloured to look like timber or plastics. The spectre of hiding places is large, the inventiveness of traffickers is huge. 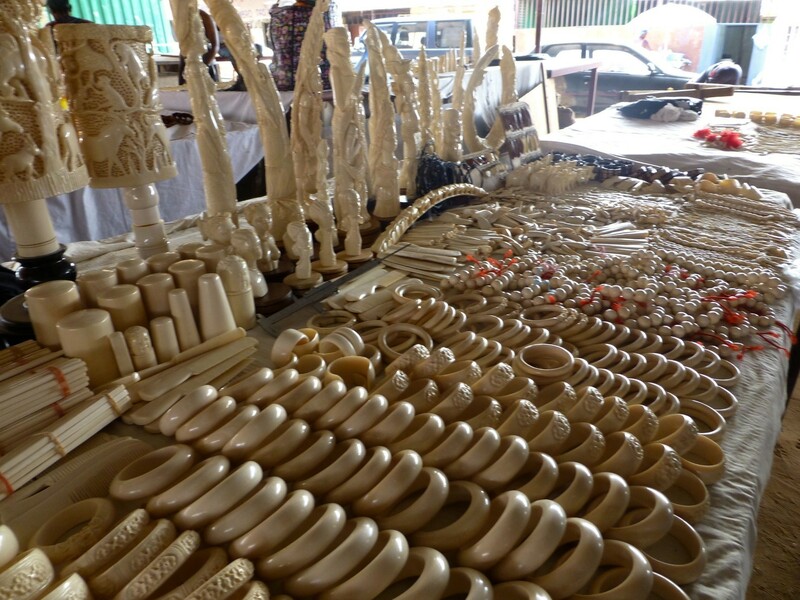 Part of ivory continues to Asia, while something remains on the European market. In Europe, illegal ivory is sold at auctions, via internet, or is mixed among antiquities. There are cases of artificial “aging” of modern ivory so it looks like antique. In 2013, Interpol and IFAW conducted a two-week monitoring of the internet during which 660 advertisements for ivory on 61 servers were found. The total volume of ivory offered this way was estimated to 4.5 tonnes and its price was 1.45 million euro. Besides antiquities, part of ivory in Europe comes from illegal imports before 1989 when Europe belonged among the biggest final markets. Recognizing illegal, newly smuggled ivory is therefore difficult. Determination of the ivory age is possible only using a radiocarbon analysis. Still more illegal ivory has been appearing also in the Czech Republic in the past years. The Vietnamese community is strongly involved in the trade. In 2016, 625 kg of ivory destined to Vietnam was seized in Berlin. Another 570 kg of ivory and machines for ivory processing were found during consequent house controls. Here as well were the offenders from a Vietnamese community, and even links to the Czech Republic appeared. The Czech Environmental Inspectorate had a genetic analysis of ivory samples seized in the Czech Republic conducted, and the results were surprising. It was a mix of ivory from various sources – from both forest and savannah elephants, from both West and East Africa. Part of the ivory in the Czech Republic came from an area occupied by Lord’s Resistance Army, a terrorist organization led by Joseph Kony, a wanted war criminal. So, the ivory that went through hands of terrorists was imported to the Czech Republic from where it was supposed to go farther. Unfortunately, the current modus operandi of the ivory trade in Europe is not known. Everybody focuses on Africa and Asia whereas Europe stays aside the public attention, although this trade exists here – it is just not so visible. In many countries, national ivory stocks are destroyed. The main purpose is to send a message to traffickers and clients that those countries do not want to support the ivory trade in any way and that they do not want seized ivory to be re-involved in the trade. The question is how large the market is and whether the amount of “not burnt” ivory would be enough to saturate it. In the past, this idea was realized two times and in both of them it had very bad consequences (see the chapter You don’t want to believe your mistakes). Ivory is a limited and more or less a non-renewable source. Such “experiments”, although sometimes well-meant, thus have catastrophic consequences. The whole current poaching crisis is caused particularly by opening markets after the sale of seized ivory. We must not repeat the same mistake. Ivory must stop to be perceived as goods and means of financial profit. Killing elephants and the ivory trade are a condemnable thing which we should not support – either directly or indirectly. 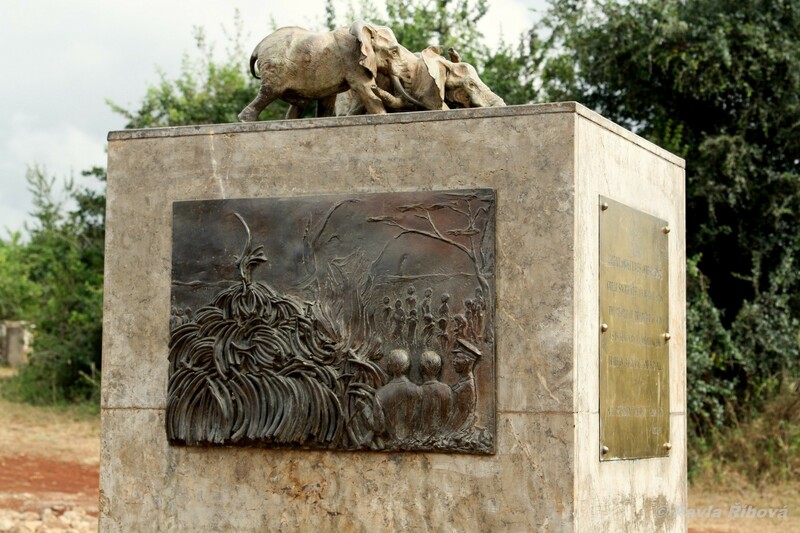 On the edge of the Nairobi National Park stands an elephant orphanage established in 1977 by dr. Dame Daphne Sheldrick. 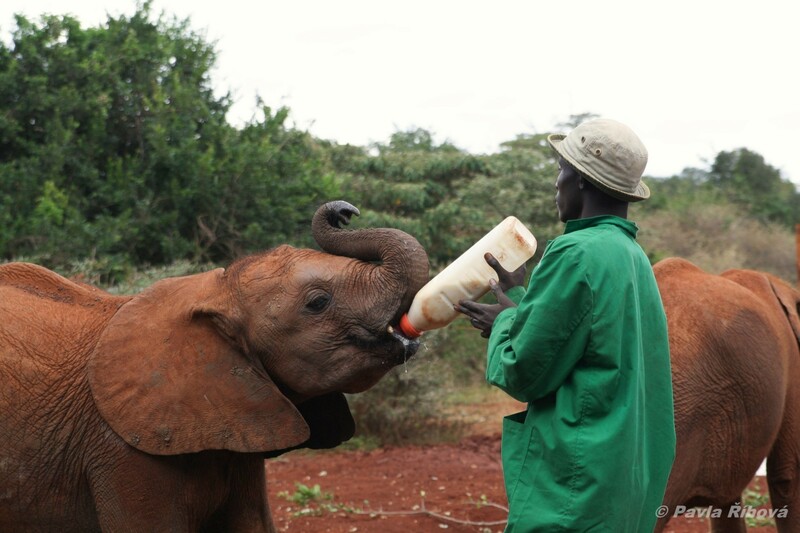 The station takes care of orphaned elephant calves that it returns back to the wild in remote parts of the Tsavo NP. 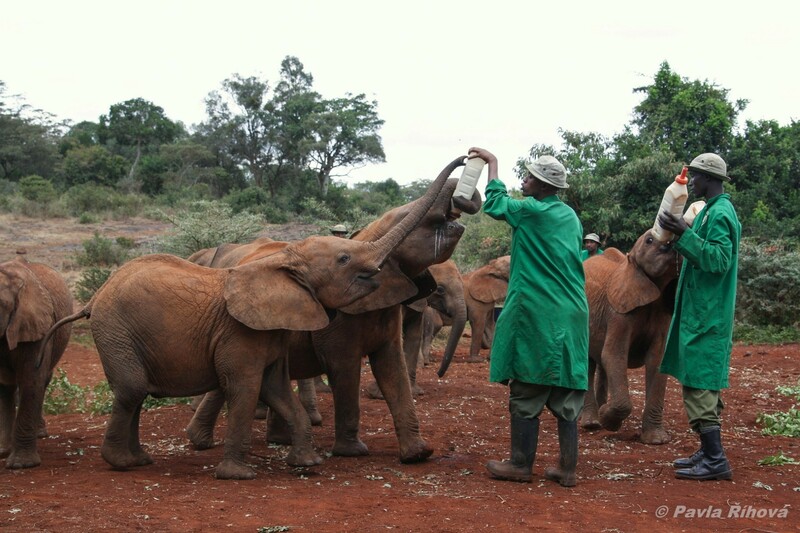 It is a complex and sophisticated system – from a rescue team connected with rangers and local communities across Kenya, to care for baby elephants which lost their mothers, to repatriation and integration in wild elephant herds. 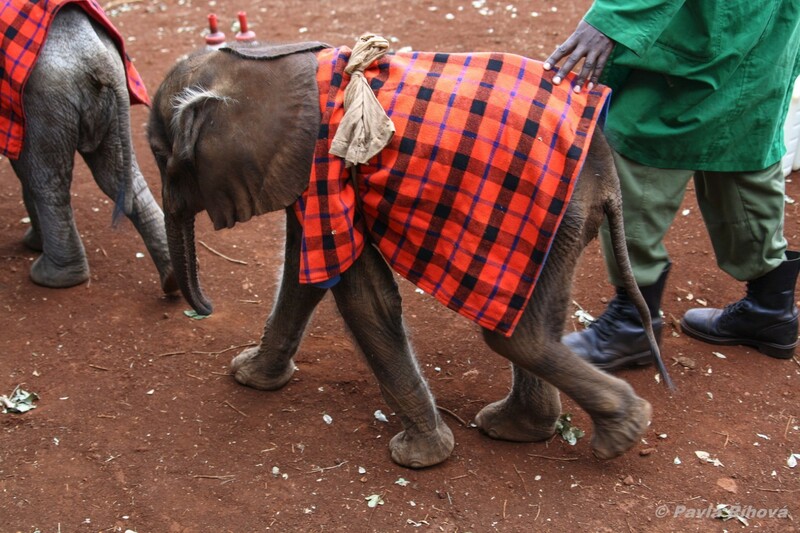 They have taken care of hundreds of elephant calves. It is probably one of the best facilities of this type. More at www.sheldrickwildlifetrust.org. The story of Daphne Sheldrick is described in the book titled Love, Life, and Elephants: An African Love Story. Although a poacher gets 80-100 USD for a kilogram of ivory from a trafficker, the ivory is sold for 2,000-2,500 USD/kg on the black market in Asia. The annual turnover of the ivory trade is estimated to 4 billion USD. There are still less elephants with huge tusks, which is why poachers kill even elephants with small tusks today. 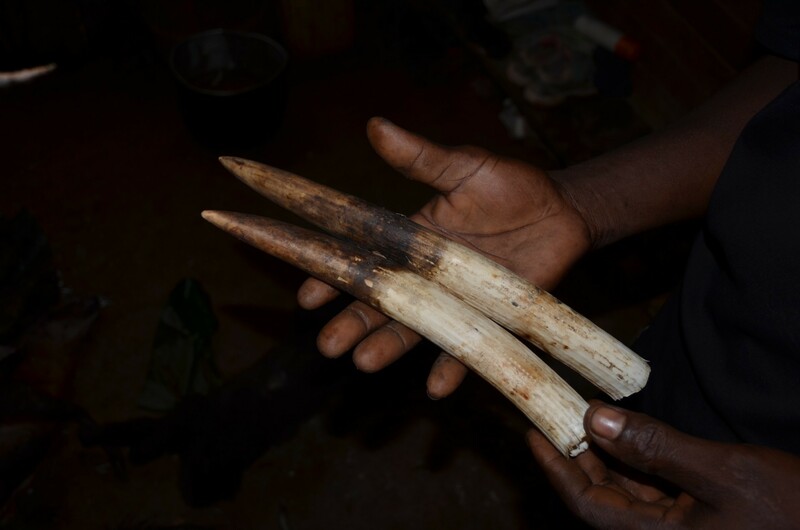 The average size of trafficked tusks is still decreasing. At the beginning of 1970s, an average tusk weighed 12 kg, in 1988 it was only 5.9 kg and today it is around 3 kg. Poachers use the social behaviour of elephants ¬as well – first, they kill a calf, the whole herd gathers to it trying to figure out was happened and to help it… The poachers thus have the whole herd together and kill the elephants all at once (in one case, 75 elephants were killed this way). Normally, a herd is scattered in the landscape and hunting is not that profitable. When poachers kill the elephants, they cut the tusks off and hide it in a hole dug out in a place they know well – if they took or transported the ivory, they would be conspicuous. After a few days, they quietly come back and pick up the buried ivory.